About sights in Ljubljana and Ljubljana architecture. It is the main square of Ljubljana, dedicated to the greatest Slovenian poet, Dr. France Preseren. His statue stands in the middle of the square and is surrounded by the finest secession buildings from the start of the 20th century. 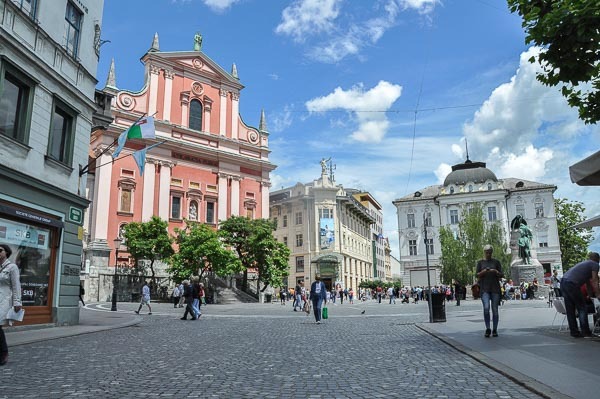 The square is connected by Plecnik’s Triple Bridge with the Old Town, Market and the river and is the perfect spot to start your Ljubljana sightseeing and your city exploration. Sitting on the statue stairs is a good way to meet locals, as it is a popular spot for a chit-chat where you can listen to street musicians and watch the locals stroll by. 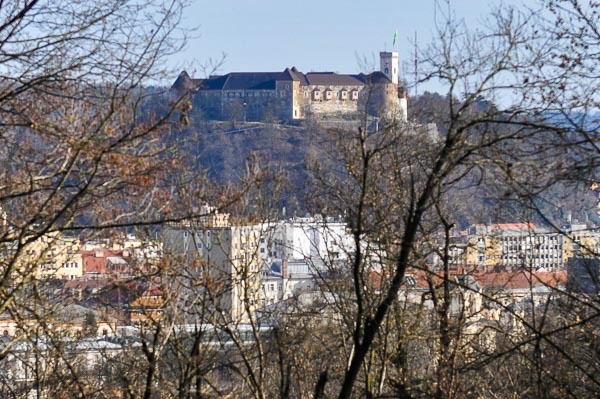 The castle, situated on the hilltop, majestically overlooks the city. 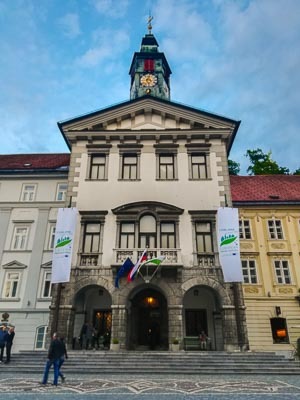 Visible from all around the town, it is an excellent orientation point for a tourist, as well as a popular point of interest and is one of the top Ljubljana sights. It was built in the middle of the 15th century as a defense fortress against the Ottoman invasions. Later it served as a governor`s residence for special occasions and also as army hospital and as a prison. It is generally open to the public for free, except for the lookout tower and museums. You can reach the castle by foot or by funicular. It is a good idea to join a guided tour to learn the most about its rich history and legends. Ljubljana`s Three Bridges (In Slovenian: Tromostovje) are probably the most well known and most beautiful of all bridges in the city and represent a popular meeting point and place for street musicians and artists. Standing on the bridge gives you an ideal view of the main square, the river, the castle and the market. A model of the bridge with the main square is displayed at Mini-Europe in Brussels. The Marketplace is on the left, the Old Town is on the right, the main square is behind and…. public toilets are underneath. 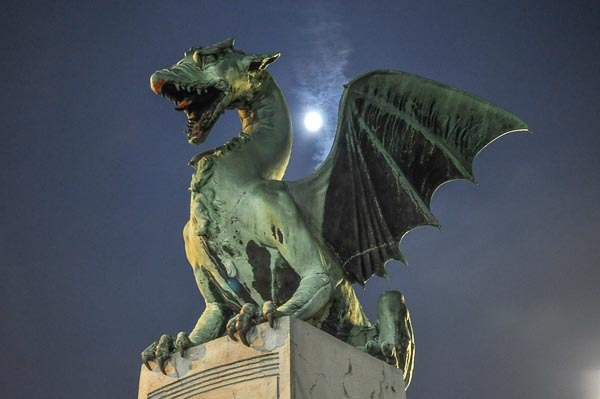 With a dragon, as a Ljubljana trade-mark, the Dragon Bridge is one of the most well known Ljubljana sights. Four green dragons, two on each side, stand proudly, to guard the bridge and the city itself. It was built in 1901 in secession art style, dedicated to Franc Josef, the Hapsburg Emperor. You can easily see it from the Triple Bridge, stretching over the Ljubljanica river at the other side of the market place. For the dragons, locals amusingly name it a “Mother in law`s” Bridge as well. 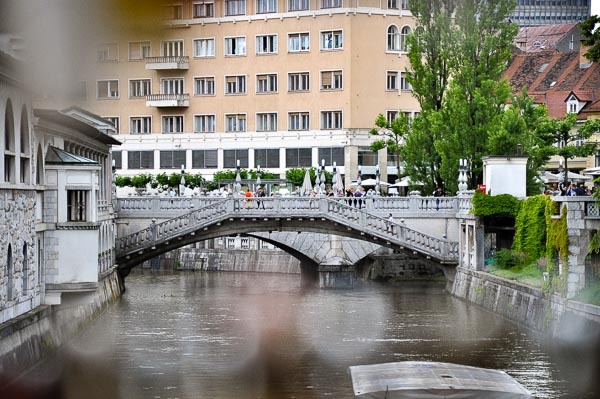 Cobblers`, also named Shoemakers` Bridge, is another bridge designed by the architect Joze Plecnik. 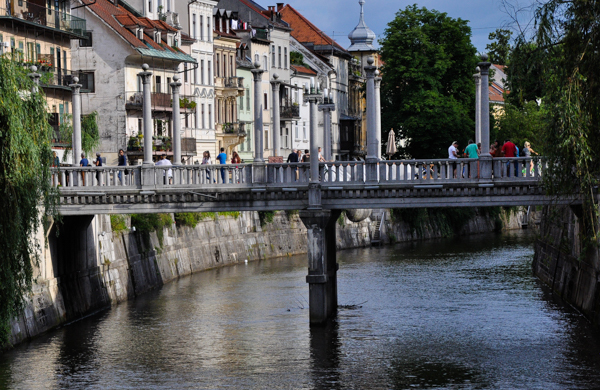 Its wooden predecessor goes to the 13th century and it was known as the Upper or Butchers` Bridge. But due to the strong unpleasant odor of meat remains that the river dragged through the city butchers were replaced by cobblers. The bridge is a link from one side of the old town to another and a popular place for street artists, musicians, painters, and tourists taking photos of the river and the city. Conceived at the start of the 20th century, Zale Cemetery got its distinctive features when Joze Plecnik redesigned it in 1940. A monumental arched entrance with massive columns represents a doorstep from the world of the living to the world of the dead. In between the cemetery itself and the doors of Had, five chapels symbolize Zale as the home to all religions, thus making them all equal. 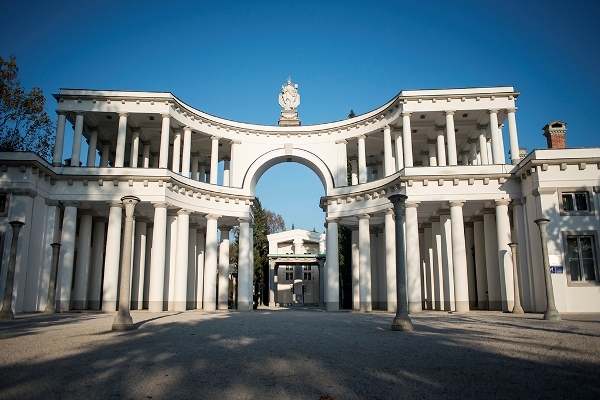 An architectural masterpiece where many soldiers of WWI and numerous writers, poets, politicians, painters and architects are buried, including Plecnik himself, is a must-see. 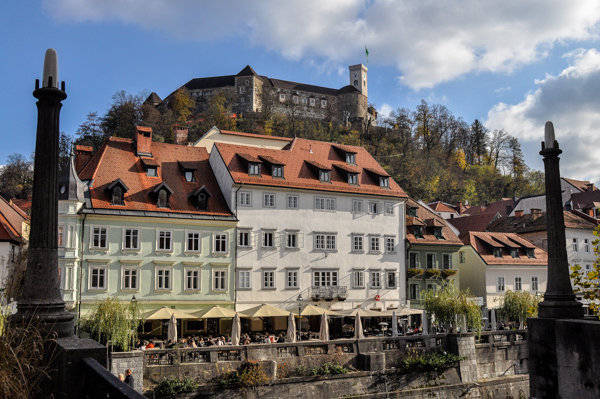 As it is not located in old Ljubljana but outside of the city center, travel via bus No. 2, 7 or 22. 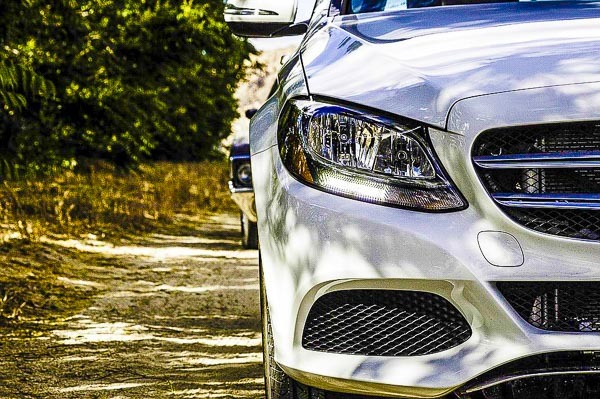 It is on the way to BTC shopping district. The Cathedral of St. Nicholas is the main church of Ljubljana and also the biggest. Due to its height, two green bell towers and a dome it is very visible – indeed it is difficult to miss. Located at Vodnik trg Square by the central market and opposite the Triple Bridge its surroundings are both vivid and constantly busy. Pay attention to both holy doors as they are true artistic masterpieces and beautiful frescoes inside. The major religion in Slovenia is Roman Catholicism, though the number of true believers is uncertain and decreasing. Entrance is free. 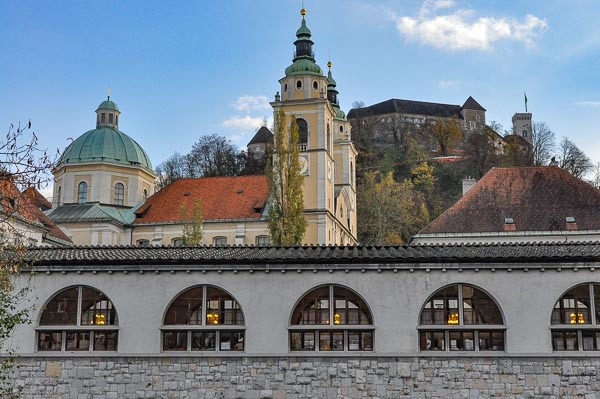 The Franciscan church, built by the Augustinians, is today one of the main symbols of the city due to its location in the central Preseren Square and its striking colour. Its triple staircase which faces the Square has been a popular spot to street artists, local seniors and anyone who likes to catch the feeling of the city, having as it does offer a great view of the Triple Bridge, the square and the locals strolling by. On the northern side of the Congress Square the Ursuline Convent of the Holy Trinity Church is situated. An undulating roof and yellow columns in the font facade make it one of the most beautiful and original baroque churches in Ljubljana. It accommodates a beautiful marble altar designed by Francesco Robba. There is a Holy Trinity column facing the church. The view of the church is best from any point of the Congress Square. Ljubljana was established around the year zero. Called Collonia Iulia Emona, the town had around 7000 citizens and was surrounded by massive walls. Emona was burned down by Huns in 452 AD, but still today you can see Roman walls, town gates, cemeteries and insulae. Some of the remains are incorporated into city architecture. 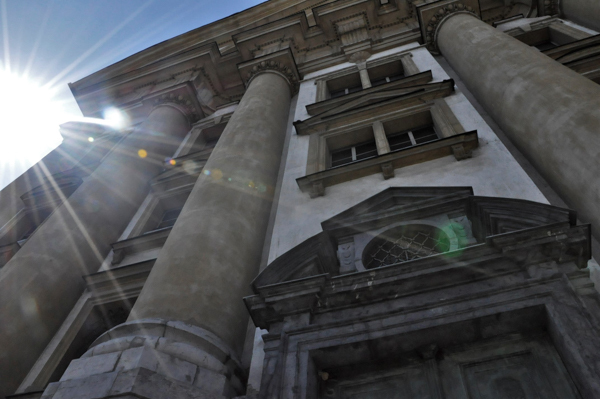 For guided tours and exhibitions of Roman Ljubljana contact the City Museum. You can find it between Turjaska and Vegova street. It is the most important work of the architect Joze Plecnik in his homeland. A palace full of architectural symbolism (e.g. windows open as books) has a massive orange and white block outside and a monumental dark marble staircase from the inside. Besides having the most extensive collection of literature in the country, it owns numerous medieval manuscripts and Renaissance prints. With Krizanke open air theatre and popular bars close by, the surroundings of NUK are usually full of youngsters. Established in 1701 as Academia Philharmonicorum, the Slovenian Philharmonic Orchestra institution is one of the oldest of its kind in Europe. The leading symphony orchestra in the country was firstly based in the former Estate Theatre, built on the same spot in 1763. After the fire in 1885, the present palace with a neo-renaissance facade was built in 1891 by the architect Adolf Wagner. Members of the institution included names such as Josef Haydn, Ludwig van Beethoven, Johannes Brahms and Niccolo Paganini. It is found between the Congress Square and the river. The Ljubljana University building was built in 1902 on the site of the previous Provincial Palace, where Austrian emperor, Russian tsar and the king of Napels ended Napoleonic wars in 1821. The Ljubljana University was established in 1919, right after the Austro-Hungarian monarchy collapsed. The balcony, where big political figures, including Josip Broz Tito, addressed crowds, faces the main entrance and the Congress Square. 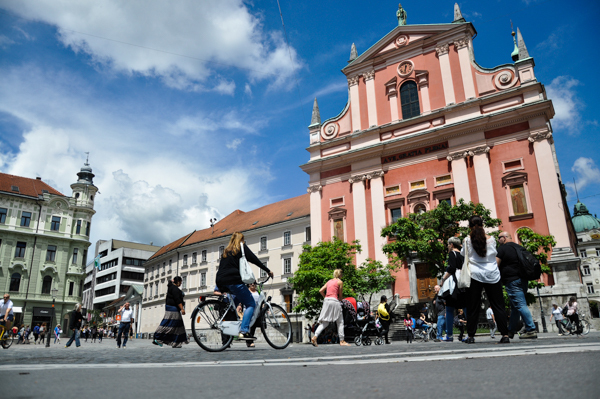 Today Ljubljana University hosts more than 60,000 students. Around 3% of the population in Slovenia are Serbs, Macedonians and Montenegrins, most of whom are Orthodox Christians. In 1936 Serbian Orthodox Church of St. Cyril and Methodius was built in Ljubljana by the architect Momir Korunovic. Five domes, fresco paintings and beautiful iconostasis are the main characteristics of the church. Services take place every day at 10.00. Find it adjacent to the National Gallery, Modern Gallery and Tivoli Park. Built in 1751 and named by the Venetian artist Francesco Robba, the fountain is definitely the most beautiful baroque fountain of Ljubljana. Its sculptures represent tree river gods symbolizing three Carniolan rivers: Krka, Sava and Ljubljanica. The fountain resembles Barigioni`s fountain from Piazza della Rotonda in Rome. 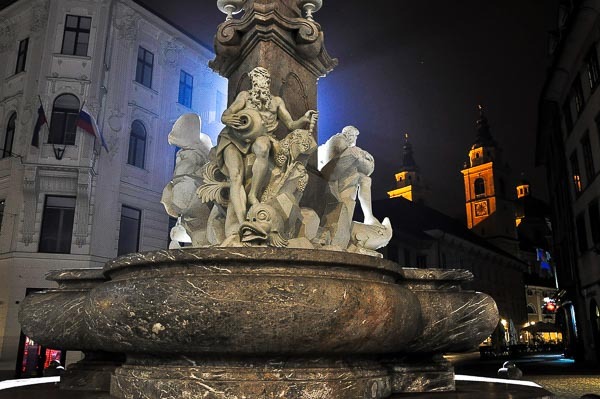 Robba`s masterpiece stands in the middle of the Town Square and with the adjacent Town Hall and neighbouring Cathedral of St. Nicholas assembles the most beautiful baroque sight of Ljubljana. From 2008 the original is stored and on sight in the National Gallery. It is one of the biggest squares in Ljubljana city center. After a monastery of the Order of Capuchin was taken down – standing on the site until 1817, the square was used for celebrations during the congress of Holy Aliance in 1821 that dealt with issues of Europe emerging after the end of Napoleonic wars. That is where its name comes from. 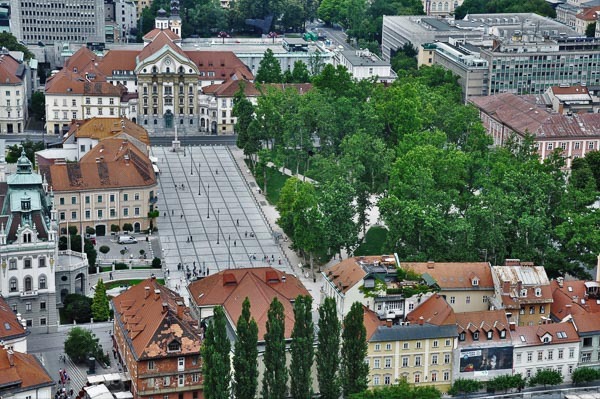 The square is extended with the green Star Park and surrounded by some of the finest historical erections like University building, Ursuline Church or Slovenian Philharmonic Orchestra building. Krizanke is a former monastery of the Holy Cross founded by Order of Teutonic Knights at the end of the 13th century. It worked as a monastery until the end of the World War II. 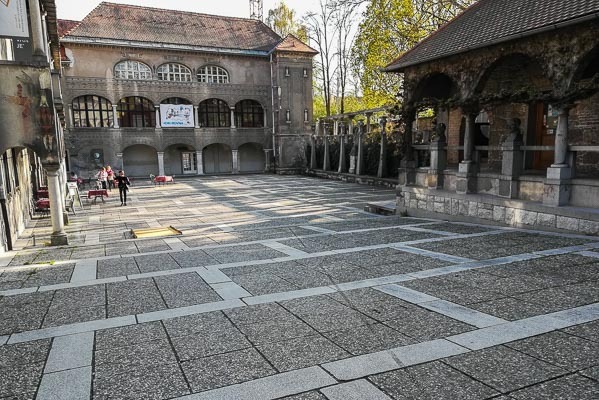 After the war it was rearanged into an open-air theater by the famous architect Joze Plecnik. Venues include the Baroque-style church, the Knight’s Hall and the Courtyard of Hell. They are all worth seeing though not open for public at all times. The central venue is the amphitheatre shaped courtyard where many concerts and main events of the Ljubljana Festival take place. The skyscraper with the same name is one of the most well known and the most distinctive buildings in Ljubljana. When built in 1933 it was the highest residential building in Slovenia and 9th highest building in Europe. Today the skyscraper serves as an orientation point and as a residential building with shops and offices on the lower floors. There are a restaurant and a sky bar at the top with a spectacular view. Located adjacent to Slovenska and Copova street it’s only a short walk from the main square. The Town Hall is undoubtedly the most dominant building of the Town Square. It was built in the late 15th century, the Baroque image was added later, between 1717 and 1719. In 1920, a monument to the Yugoslav King Peter I was placed before the entrance to the Town Hall. The monument, designed by architect Joze Plecnik, was destroyed by the fascist occupying forces in 1941. On the edge of the Town Square just in front of the Town Hall the “Fountain of Three Carniolan Rivers” stands, designed by sculptor Francesco Robba. Feel free to enter. The Town Hall is open every day as its courtyards on the ground floor are intended for presentations of city projects. The most impressive are the sgraffito decorated arcade courtyard, the Baroque Narcis fountain and the Hercules statue from the late 17th century.